HTML is used on every page you browse on the Internet. The purpose of HTML is to create the basic page layout and put text and images on the web page. With HTML, you style text with special text keywords called elements, which apply a special effect. The element is a letter, word, or phrase with special meaning. For example, h1 is an element that applies a header effect, with bold text and a large font size. The element is enclosed with a left-angle bracket (<) and a right-angle bracket (>), such as <h1>. An element enclosed in this way is called a tag. An opening tag (such as <h1>) is followed by a closing tag (</h1>). Note that the closing tag differs from the opening tag by the addition of a forward slash after the first left bracket and before the element. When all three conditions are met, the text between the opening and closing tags is styled with the tag’s defined effect. The example code displayed in a browser. The browser recognizes the h1 element. The h1 element is surrounded with a left (<) and right angle bracket (>). The opening tag (<h1>) is followed by text and a closing tag (</h1>). Note how the h1 tag itself does not appear in the heading. The browser only displays text between a properly formatted opening and closing HTML tag. The remaining lines of code are displayed as plain text because they do not fulfill all three conditions. Every left-angle bracket must be followed after the element with a right-angle bracket. In addition, every opening HTML tag must be followed with a closing HTML tag. Headings created using elements h1 through h6. 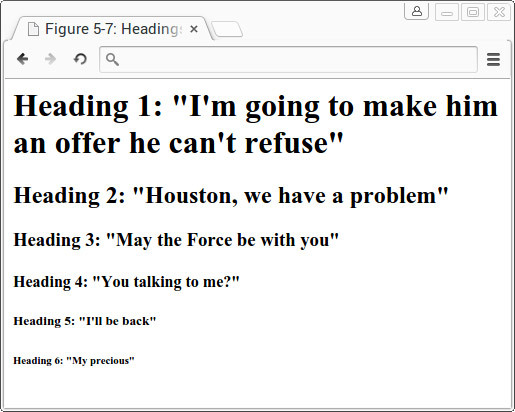 To display text in paragraphs, you can use the p element. Place an opening <p> tag before the paragraph and a closing tag after it. The p element takes text and inserts a line break after the closing tag. To insert a single line break after any element, use the <br> tag. The <br> tag is self-closing, so no closing tag is used. Following are examples of coding a paragraph. 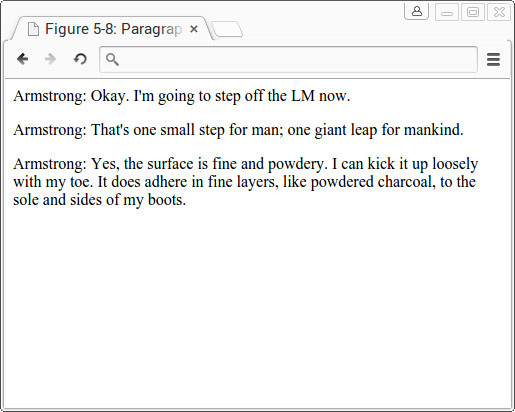 Text displayed in paragraphs using the p element. Link destination: The web page the browser visits after the link is clicked. Link description: The words used to describe the link, which are more readable and descriptive than the link destination. To create a hyperlink in HTML, start with an opening anchor tag (<a>) with an href attribute. Attributes modify HTML elements and are placed inside the opening HTML tag. Then add the value of the href attribute, which is the link destination. Then add text to describe the link after the opening anchor tag, and finally include a closing anchor tag. Three hyperlinks created using the a element. When rendering a hyperlink, the browser underlines the link and colors it blue by default. Google’s search engine ranks web pages on many factors but primarily based on the words used to describe a web page between the opening and closing <a> tags. To include an image on your web page, you must obtain the image’s web address. Websites such as Google Images and Flickr allow you to search for online images based on keywords. When you find an image you like, right-click the image and select Copy Image URL. 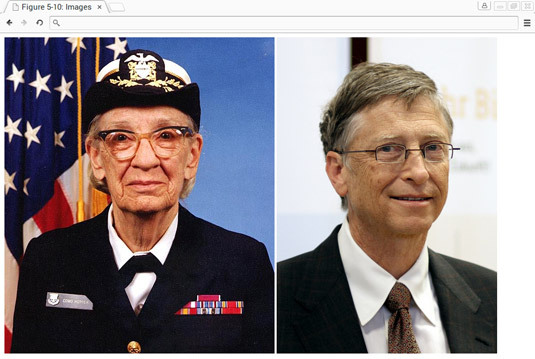 Here is the result, with US Navy Rear Admiral Grace Hopper on the left and Bill Gates on the right. Images of Grace Hopper and Bill Gates rendered using <img>. The image tag is self-closing, so you don’t use a separate </img> closing image tag.